Florence flattened trees, crumbled roads and knocked out power to more than 700,000 homes and businesses, and the assault wasn’t anywhere near an end. A mother and baby were killed when a tree fell on a house, according to a tweet from Wilmington police. The deaths also included that of a person killed while plugging in a generator, the governor’s office said. “I feel like the dumbest human being who ever walked the face of the earth,” said Ballance, owner of a seafood restaurant that was flooded. By early afternoon, Florence’s winds had weakened to 75 mph, just barely a hurricane and well below the storm’s terrifying Category 4 peak of 140 mph earlier in the week. But the hurricane had slowed to a crawl, drenching coastal communities for hours on end. 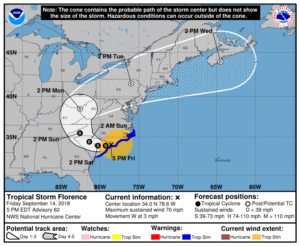 Florence made landfall as a Category 1 hurricane at 7:15 a.m. at Wrightsville Beach, a few miles east of Wilmington and not far from the South Carolina line, coming ashore along a mostly boarded-up, emptied-out stretch of coastline. It started pushing its way westward across South Carolina later in the day, in a watery siege that could go on all weekend. Preparing for the worst, about 9,700 National Guard troops and civilians were deployed with high-water vehicles, helicopters, and boats that could be used to pluck people from the floodwaters. On Friday, coastal streets in the Carolinas flowed with frothy ocean water, and pieces of torn-apart buildings flew through the air. The few cars out on a main street in Wilmington had to swerve to avoid fallen trees, metal debris, and power lines. Traffic lights out of order because of power failures swayed in the gusty wind. Roof shingles were peeled off a hotel.